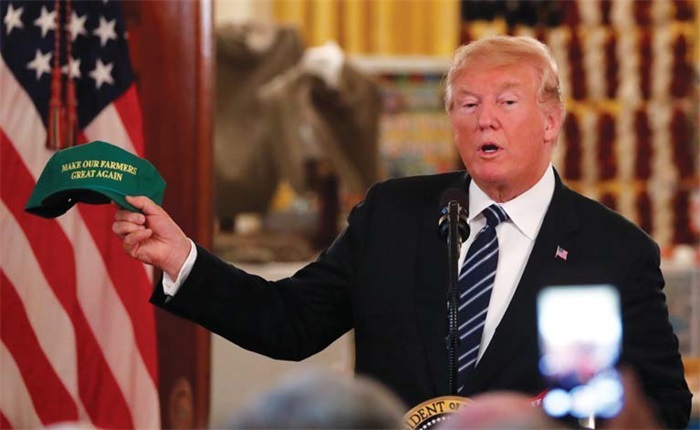 The relief plan US President Donald Trump's administration announced on Tuesday is raising questions among agricultural experts, who are calling for the removal of recently imposed tariffs on major trade partners of the United States. Businesses and industry associations also expressed concern about tariffs imposed on imports from China and requested exemptions from US tariffs at a public hearing in Washington on Tuesday. "The American Soybean Association has consistently advised the administration that the best way to reduce our nation's trade deficit is by increasing exports, including agricultural products," said John Heisdorffer, ASA president and a soybean farmer in Keota, Iowa. The administration will offer a $12 billion emergency aid package for farmers hurt by other countries' retaliatory tariffs against US agricultural products. The program, which will use existing funding, includes direct payments to farmers of key agricultural exports, direct commodity purchases by the US Department of Agriculture and funding to create new markets for US foodstuffs. "It seems like a good political move for Trump, but it is a stopgap measure at best," said Larry Karp, professor of agricultural and resource economics at the University of California at Berkeley. "It also shows that the trade war is really beginning to affect his base." In the past few months, Trump has imposed punitive tariffs on several of the country's largest trading partners, including China, Canada, Mexico and the European Union. After $34 billion in tariffs on Chinese goods took effect on July 6, China retaliated in kind, targeting US soybeans, corn, dairy, pork and other agricultural products. Canada, Mexico and the EU also struck back at Trump's tariffs on their steel and aluminum by hitting US-made goods. Since the Sino-US trade dispute began heating up in late May, US soybean prices have dropped more than $2 per bushel, according to the ASA, which represents 21,000 US soybean producers. Last year, China imported 31 percent of US soy products, equal to 60 percent of total US exports and nearly one in every three rows of harvested beans. The organization predicts next year's exports will slump 11 percent despite a near-record harvest this year. Compared with short-term assistance, the ASA wants "long-term answers to the pinch of tariffs — or to see the tariffs rescinded". Dermot Hayes, pioneer chair in agribusiness at Iowa State University, noted two long-term concerns about the aid package. "One concern is that it will remove domestic pressure to stop the trade war from escalating. Another concern is that farmers will be relying on government subsidies and not the free market," he said. US consumers also stand to suffer from rising tariffs. Hun Quach, the Retail Industry Leaders Association's vice-president of international trade, who brought ribbons, tapes and Christmas lights to the first day of a two-day hearing held by the Office of the US Trade Representative, said: "If America's retailers face any increase in the cost of products in the form of a tariff, it will mean higher prices at checkout for American families in the coming holiday season." Products such as Christmas lights, cling wrap, soap dispensers, fog machines and shower heads are on the tariff list. The proposed tariffs will impact "the budget of American families, especially lower and middle-income families who can ill afford to pay more for everyday consumer goods", said Quach. "The impact of these tariffs will reverberate throughout the US global value chain, targeting consumers, retailers and our US-based suppliers who design these products," she added. Impak Films US, an Atlanta-based business servicing the flexible-packaging industry, is supplied by only two manufacturers that can meet its requirements, and both of them are in China. "The Chinese suppliers now know how to serve our customers," said Ed Jenkins, Impak sales and marketing manager. The tariffs will make the products "extremely expensive", and the company will be forced to find other sources, which Jenkins said was unlikely. "Neither we nor our customers have been forced by the Chinese manufacturers or the Chinese government to share any IP (intellectual property)," Jenkins said, adding that the company didn't face any restrictive licensing rules, require joint ventures or set competitive restraints.